I go to Piñas Bay, on Panama’s south Pacific coast, for one reason: to photograph black marlin. It’s a lot closer to my home in Florida than Australia, which is the only other place I know where I can find this gamefish. I’ve been to Piñas Bay nine or 10 times, but I rarely fish while I’m there. I want the people with me to catch fish so I can take pictures of them. I will sit on a boat for a week just to shoot one good series of a black marlin jumping. 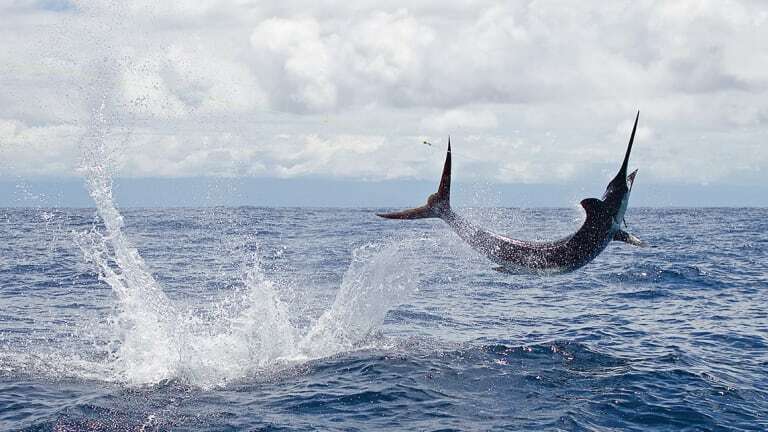 The blacks are big — usually bigger than the blue marlin you’ll see in Panama — they are powerful, and they are spectacular jumpers. It’s difficult to get good shots of blue marlin. When you hook one, it usually greyhounds 100 yards, then veers sideways for another 100 yards — out of camera range — after which it sounds. By the time it’s reeled in close enough to take good photos, the fish is worn out. As soon as a black marlin gets on the leader, it starts jumping and won’t stop. It’ll jump a dozen times. It’s a big, beautiful fish, and I can shoot them so close to the boat you’d think they’re going to jump into it. You can tell the difference between a black marlin and a blue marlin by their pectoral fins. 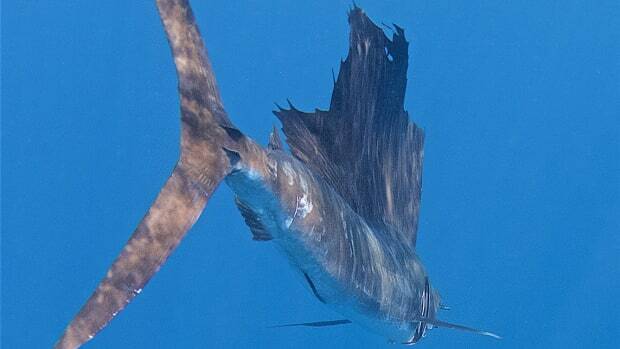 The black is the only marlin with rigid pectorals that can’t fold up flat against its body. Sometimes we find blacks a mile out, other times 20 miles. It depends on where they’re feeding that day. 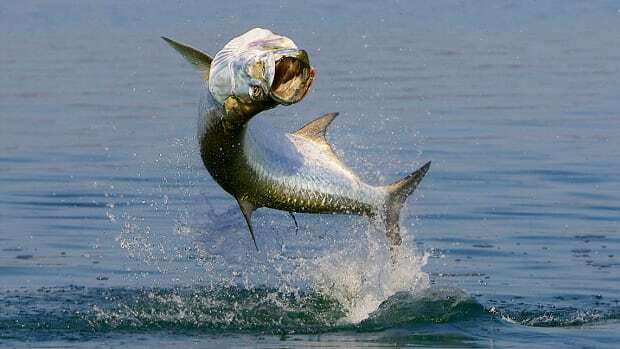 We put out three live baits — usually skipjack, 10 to 15 pounds each — and slow-troll them. Dolphin (mahi-mahi) are a real nuisance for the crew when we’re hunting blacks. They attack the marlin baits, and the mate will frantically reel in the bait before the dolphin kills it, which brings the super-excited dolphin right up to the stern, where you flip out a popper on a spin or fly rod and hook up some real monsters. This is the best place I know to catch big bull dolphin on light tackle, especially a fly rod. One year, all of the guests at the lodge — Tropic Star Lodge, where fishermen stay when they come to Piñas Bay — held a one-day dolphin tournament: The biggest dolphin wins. 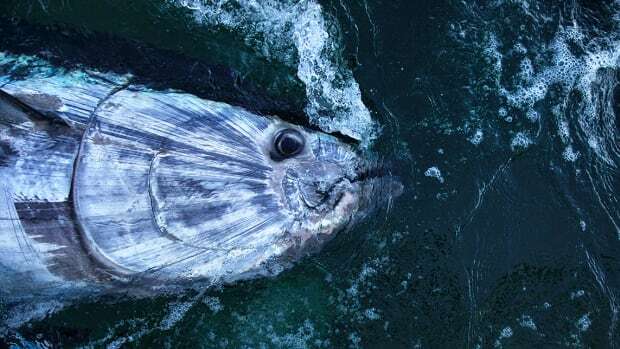 One team caught a bull that weighed 64 pounds; they decided to resume chasing marlin because they thought they were a shoo-in. At day’s end, they came in fourth. The winning fish weighed more than 70 pounds! 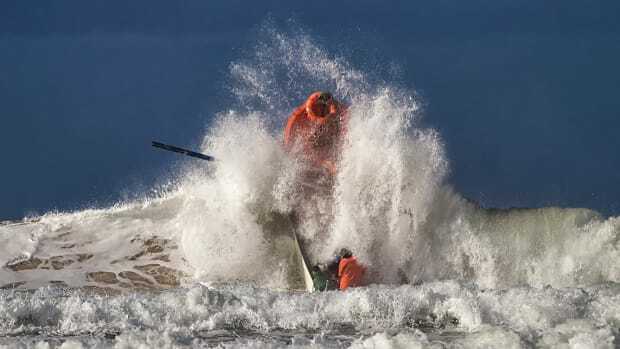 If you want to catch a world-record dolphin on a fly rod, Piñas Bay is the place to do it, though I generally don’t recommend bringing fly rods there. Everything’s too big. 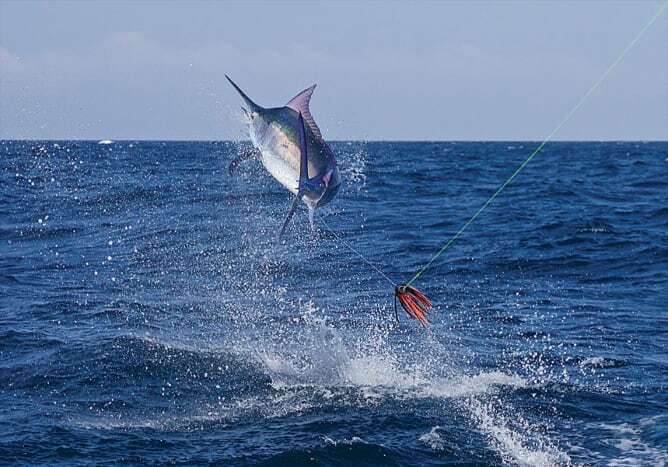 These waters have some of the best fishing in the world, not just for dolphin and black marlin, but also offshore for blue marlin, striped marlin, sailfish and yellowfin tuna. Inshore you can drop a blue runner over the side or toss surface plugs to rocky cliffs where the water plunges to 100 feet and catch big amberjack, cubera snapper, grouper, roosterfish and wahoo. Seeing a 40-pound cubera hit a surface plug is quite an experience. Zane Grey Reef is a solid-rock seamount in Piñas Bay that rises from a depth of 350 feet at its base to three peaks, the tallest 120 feet down. Ocean currents, rich in plankton, push northward past the seamount, which supports a cornucopia of baitfish and their predators — amberjack, jack crevalle, cubera snapper, mullet snapper and grouper, as well as marlin, sailfish and tuna. This is where Zane Grey caught his first black marlin. It’s usually our first stop on an outing to catch bonito or skipjack for bait. The reef is 20 minutes from Tropic Star Lodge, a five-star hotel carved into a hillside that drops down to the bay in the remote Darien jungle. 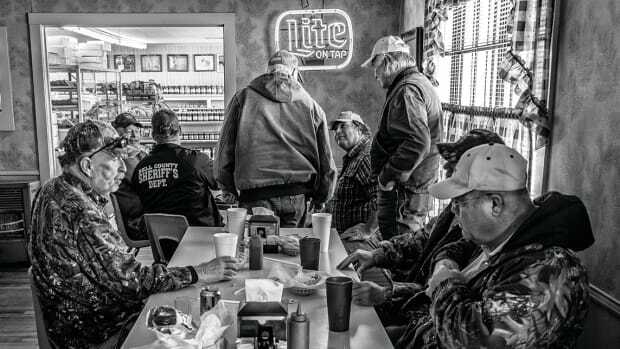 The 52-year-old lodge — accessible by boat or charter plane — accommodates 38 guests and is the only game around. The food, service and facilities are outstanding. The lodge is open from December through October. 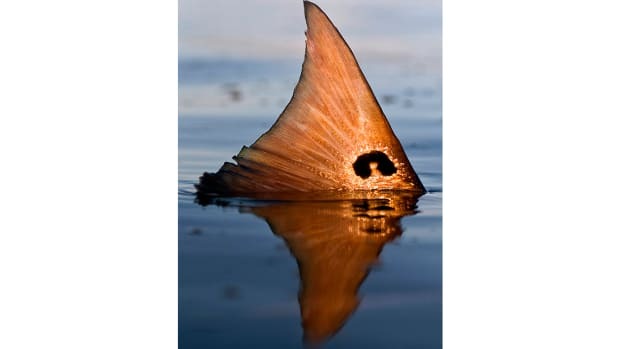 The best marlin fishing is December through mid-March and July through September. 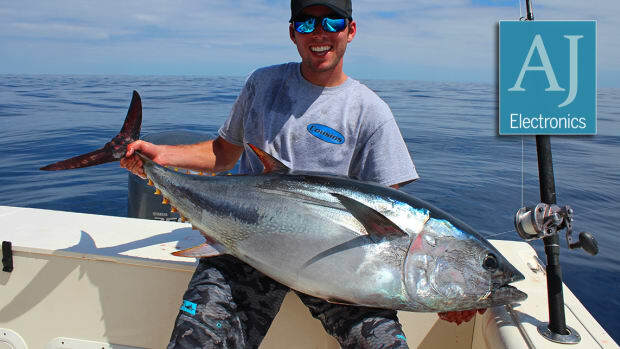 The fishing for cubera, roosterfish and tuna is good year-round. The lodge has a fleet of 16 Bertram 31s — identical except for their distinctively colored hulls. They’re known as the “rainbow fleet.” These twin-diesel fishing boats are classics that ride well and catch fish. Known as the “lost burial ground of 31 Bertrams,” the lodge equips and maintains them well and has its own full-service yard. The service staff can replace an engine overnight and have the boat back on the water the next day. 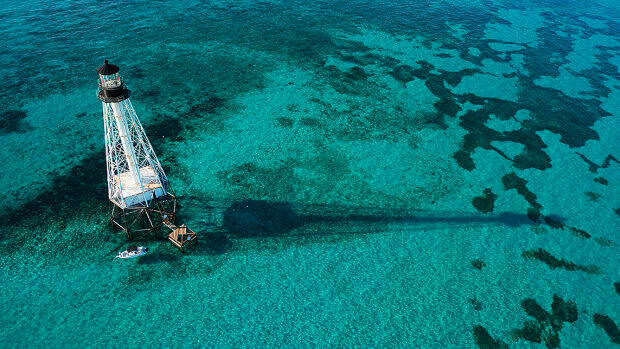 Tropic Star Lodge draws its share of celebrity TV anglers, among them Larry Dahlberg of The Hunt for the Big Fish; Chris Fischer of Offshore Adventures; Jimmy Nelson of Extreme Fishing Adventures; and Tom Ackerman of Escape to the Wild. I spent a couple of weeks there with Guy Harvey, working on a TV documentary about Panama’s marine habitats. Guy always says that if he had one week to live, he’d spend it at Tropic Star — and he’s been everywhere. Miami lawyer Pat Ford holds a dozen IGFA world records. 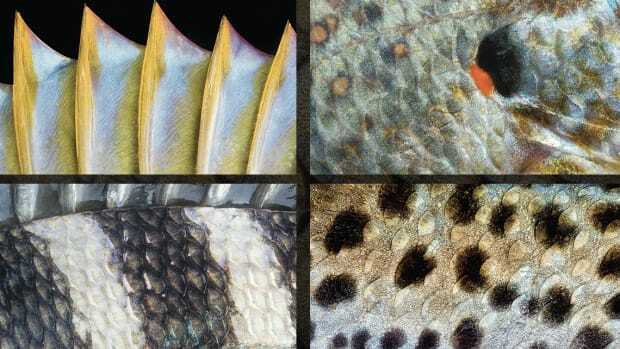 He has been taking photographs and writing about fishing for 35 years and is the author of The Best Fly Fishing Trips Money Can Buy and, with Andy Mills, A Passion for Tarpon. Check out some of Pat Ford&apos;s spectacular fishing shots from Piñas Bay, Panama in the photo gallery below. Photographer Ford says he will sit on a boat for as long as it takes to get a great shot of a black marlin. These spectacular jumpers often go airborne close to the boat, making for great images. My first love is catching largemouth bass. I keep a 14-foot aluminum Tracker at my cousin’s house in Texas and use my mother’s Dodge van to tow it to the lakes and reservoirs when I’m there.